Boxing has seen its fare share of ludicrous and irresponsible match-ups in the past but recently the outrage has become the norm. One mainstream title is being passed around without any regard of rankings, weight limits and boxers’ safety. Money can’t buy health. The WBC middleweight title has become the black sheep of boxing. It is an illustration of the turmoil and disorder in the industry. The last time it was actually a middleweight belt was in 2014 when Miguel Cotto was parachuted into a title fight against Sergio Martinez. He got the Golden Fleece but had a hard time getting a good deal for it. A welterweight with a middleweight belt is like a stray dog crossing wolf country. Cotto defended his title against one Daniel Geale who on top of being unrated had to go down to 158 pounds in order to get paid. There was no second defense. Miguel Cotto won the lottery in the form a fight with Saul “Canelo” Alvarez and he no longer needed the middleweight belt. They agreed on a catch weight limit of 155 pounds. It was a weight that suited the super welterweight Canelo more than it suited Cotto. It was comfortable for both of them but had nothing tot do with the middleweight division. Not only the weight wasn’t right but the champion refused to pay his dues to the WBC and lost the title two weeks before the fight. “I don’t need a title to find Canelo”, he said as he realized he could milk the sport without needles overhead. Canelo was not at the right weight neither at the weight in (155 lbs) nor on fight night (170+ lbs) and had no grounds to fight for a middleweight belt which had been lifted from his opponent anyway. They didn’t need a title to fight each other but apparently the title (WBC) needed them. Canelo somehow emerged as the new WBC middleweight champion of the world. He has the Mexican fan base behind him and being a cash cow, he could have gotten the light heavyweight and cruiserweight titles as well, it would have been just as relevant. He could have defended them against Juan Manuel Marquez; he would have been more relevant than Khan. Amir Khan was chosen as a first challenger for Canelo’s title and this was not just a scandal and an insult to the fans, it looked more like an act of human sacrifice. 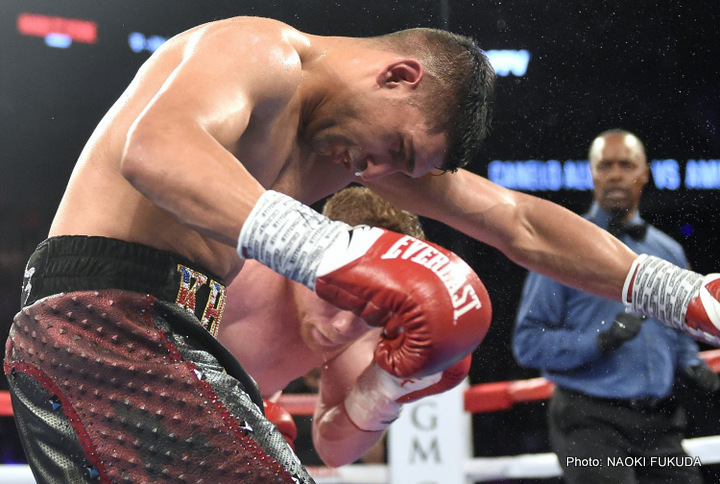 The weight limit of 155 pounds was just wishful thinking: Khan could balloon no more and Canelo would enter the ring as a light heavyweight Boxers are not blame, they have little or no influence on match making and do what they do in the ring, it’s their management that bears all the responsibility. I won’t elaborate on the disgraceful mismatch which ended with the unconscious British boxer’s head bouncing three times from the floor. Senseless destruction and health damage have nothing to do with sports and entertainment. Khan’s coach was embracing and kissing his charge after he regained his senses but his remorse and guilt meant nothing as he probably did his best to prepare his boxer. Virgil Hunter made an emotional post-fight appeal to Canelo to fight his mandatory challenger GGG, saying: “…we set the tone, we made a concession, we took the risk, fighters should fight each other…”. Apparently he sees GGG as an equalizer for his boxer’s ordeal against a bigger and stronger fighter. It is well known that Canelo’s walk around weight is above 175 lbs while GGG typically weighs 168-170 pounds between fights. It is not really a concession on Canelo’s part to fight the mandatory challenger, it is a question whether the macho man will man up. The WBC middleweight champion is still expected to make a debut at middleweight.